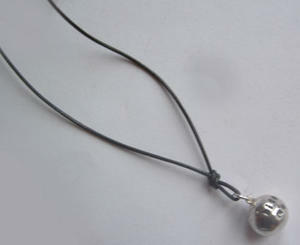 Necklace with real silver bullet. Bite the bullet, 11,5 grams solid silver. The bullet is appr. 1x1cm and each bullet is handcasted in a sandform, so every piece is unique. The silverbullet comes with a black leather strap (1mm) with a small manufacture-tag, also made of sterlingsilver).